It's Saturday morning and that means baby boy -- let's just call him "E" -- will be here in 3 days. We'll actually be heading to the hospital in 2 days, on Monday night, to get this party started. Hard to believe this is our last weekend as a little family of 4! I've got a lot of thoughts swirling around in my head about this major family change heading our way. Mostly I'm excited to see how LO embraces her role as big sister all over again. Last time, when Chase was born, she was not quite 2-1/2, and didn't have much of a clue about what was going on. This was actually a big blessing to hubs and I because of our relocation to Charleston, Chase's birth, surgery and 5-week hospital stay, etc. She didn't really get the opportunity to do big sister stuff like hold her new baby brother, help give him a bottle, etc. This time around, I can assure you, she's geared up to put her best big sister game face on and be the big helper I'm sure we'll need! She's already helped me with his laundry and "ooohed" and "awwwwed" over his cute little socks, etc. She's talking about holding him, feeding him, and getting him his paci when he needs it. I just know she's gonna do great and I'm so thankful we have such a wonderful, special, sweet, caring little almost 6-year-old girl to help her mommy & daddy adjust to baby #3!!! Whew. I'm so excited for the next few days. I'm so grateful for all God has blessed us with. I can't wait to meet little E, and see how his big sister and big brother adjust to having him here. God is so good! I had my 38 week appointment and growth ultrasound this morning. Baby is now estimated up to 6 lbs. 6 oz.!! He was 5 lbs. 15 oz. last Tuesday, so his growth is on track. That means with another week to gain another 1/2 pound, we should be looking at around 7 lbs.! I'll certainly take that, especially after LO's 8 lbs. 13 oz. and Chase's 8 lbs. 9 oz.! Not much else to report. I'm feeling really good, energy level is decent considering, and my weight gain is still totally baffling to me, in a good way! I think I'm around 18 lbs. and that's waaaaay better than what I saw with my previous two pregnancies. Woot! Everything is basically ready for him to make his debut next Tuesday. Just need to finish packing my hospital bag and brush up on my photography skills! We officially have our marching orders to head in next Monday evening to get things started, with the induction meds starting Tuesday morning! LO is getting excited about meeting her newest little brother. She's got the count down going and it's so cute! I just know she's gonna be a big help and will be so in love with the little guy. Chase, on the other hand, I don't think fully understands what is getting ready to happen. ;) Should be fun!!! For documentation purposes, as well as some good ol' Internet embarrassment, here's big ol' me at 38 weeks! Here's a little video of Chase from earlier today that totally cracks me up. He was eating lunch, which typically also includes a video (so mommy can get a solid 15 minute nap on the couch), and busted out the opening song for "Little Einsteins." It was so cute that of course I had to record it and share it here! We're down to 14 more days 'til the little guy's arrival! I had an OB appointment this morning and we went ahead and did growth measurements, even though it's only been a week since our last growth u/s. Let's just say mommy was extra nervous and slightly concerned going into the appointment today since the boy weighed in at 5 lbs. 4 oz. last Tuesday -- around the 13th percentile for his gestational age. Not good. That was compounded by the fact that he hadn't seemed to be as active to me the past day or two as he had been, and I was super worried. My fears were put somewhat to ease by the fact that he measured 5 lbs. 15 oz. today, a growth of 11 oz. over the past week, which, as you may know, is right on target with the "half a pound per week" he should be gaining from week 36 on. Whew! I was really concerned about this, especially since according to the doctor's scale, I had LOST 3 pounds from Friday to today! Crazy. The little stinker did fail one part of his biophysical profile u/s... We weren't able to catch him "practice breathing" even though he's been really good with that in the past. No worries, though. I'm told they only do that every once in a while, not constantly, so it wasn't a big deal. The office was making the call today to go ahead and put me on the books for an induction on Tuesday, April 30th as planned. They'll check me at my appointment next week to see if I'll need to come in Monday night for Cervadil, or if I can just get admitted bright & early Tuesday morning to start the Pitocin. Both of my previous inductions included Cervadil the night before, so I'd be surprised if this time around was different. It's hard to believe we're looking at less than 16 days until the little guy's arrival. I'm happy to report we are SO totally ready for him to get here... except for the tiny little fact that I haven't yet packed a single thing for our inevitable hospital stay. Ooops! And to think everyone says mine and the baby's bags should have been packed by week 35 and here we are approaching week 37 on Tuesday. Oh well! Here's hoping we don't have an unexpected early arrival and our guy sticks to my plan. 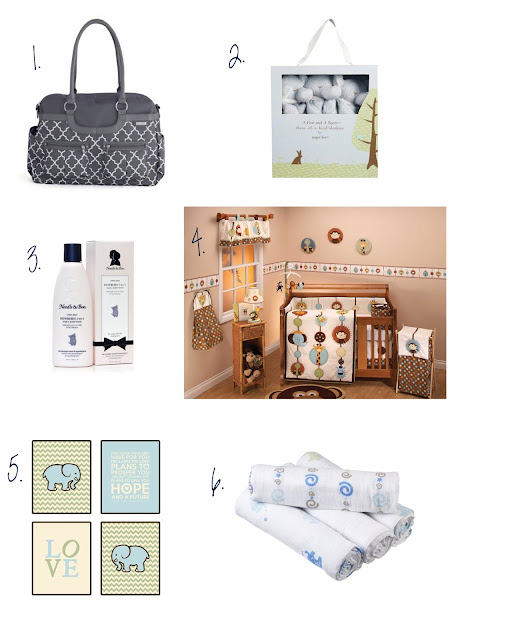 Today I was thinking about some of the baby things I'm most excited about this time around and thought I'd share a few of them here. Luckily we had a lot of the essentials already, and we have been very blessed by friends and family who have increased our stash with missing must-haves like clothes, blankets, towels, bottles, etc. So these are just a few of the things that get me super stoked about all things baby! A new diaper bag? Yes, please! I just purchased this little lovely from my dear friends at Amazon yesterday, and am dying to get it here so I can see it in person! The reviews on it are awesome and it sounds like it has a TON of pockets -- both inside and out -- and is super cute and stylish to boot! Win! Angel Dear elephant lovies for the boy. You may not know this, but LO had her Angel Dear Teddy and Chase still has his Angel Dear Monkey. We find something we like and stick with it, huh? I especially love this 3-pack because you ALWAYS have to have a spare so your little one isn't without their BFF on laundry day. Noodle & Boo? Sounds funny, but I'm hoping it smells fantastic and works well on my little guy. I wanted to try something other than Johnson's Baby this time, and I found this product had great reviews across the web. Also ordered from Amazon, it should arrive this week and I can't wait to give it a whiff! I decided to use Chase's crib bedding for the baby, and I'm so glad I did! I had mixed feelings about it but in the end I decided it didn't make sense to buy another set when we had such a cute one sitting up in the attic! I love the way it looks in his room and I'll be sure to share pics soon. NOTE: I don't have all of the items pictured here as that would be some serious jungle animal overload! Ha! Nursery wall art by Mommy? A must-have!! I was inspired by this beauty from etsy seller DallowayPlaceKids, but wanted to put my own spin on it (of course). The verse from Jeremiah is one of my all-time favorites and so very appropriate! I've heard such wonderful things about these adorable muslin swaddle blankets! My sister is using them with her sweet little not quite 3-month-old daughter, and it sounds like they couldn't be more functional! Plus I just die over the little blue elephants! Looking forward to wrapping these little guys around my precious little guy!!! So that's my little roundup for today. I just thought to myself I should do another post like this one except with the essentials for Mommy, but was so saddened to realize I really don't have any special pampering products for myself! Just the basics, which is no fun! Oh, well! Well, somehow I've managed to make it through my first 35 weeks of this pregnancy without sharing a single weekly "how's it going" update or pic. Geez! Guess it's been a busy 8 months, huh? 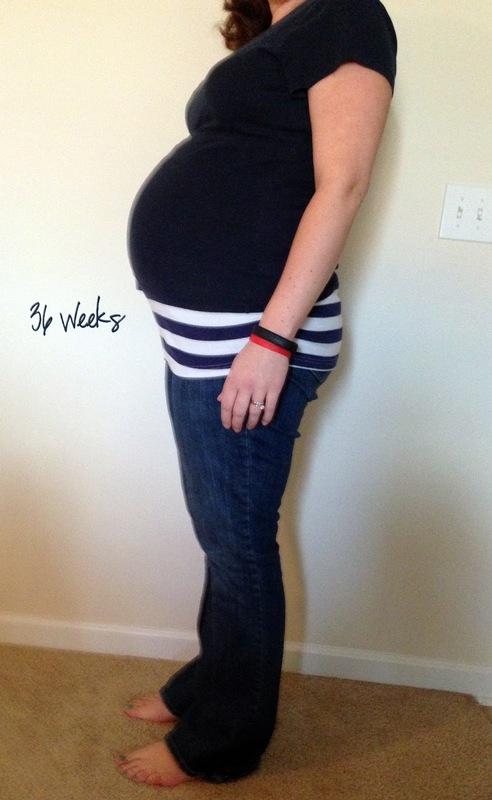 Anywho, I thought I'd rectify this by posting a 36 weeks update today. Hard to believe we're 21 days (or less?!) away from our littlest guy's arrival! Belly Button in or out: Still in. It always stays in. Thank goodness! Wedding rings on or off: Still on, and I'm amazed by this fact! I'm pretty sure they came off around 6 months when I was pregnant with LO. Here I am 36 weeks pregnant and rings are still on. Nice! Food cravings: As if I'm allowed fun pregnancy cravings with the wonderful gestational diabetes diagnosis I received back in January... Ugh! No worries, though. I've somehow managed to keep myself to about 1,800 calories per day with a higher protein, lower carb "diet" than what I ate before. And I've somehow been able to sneak in ice cream (Culver's, Chick-fil-A... you name it!) without going crazy overboard. Food aversions: None. But I am sad to report that basically EVERYTHING I eat causes heartburn, especially late at night. Boo. Energy level: Surprisingly, my energy level is straight up normal! For the most part, I'm rocking work, household chores, caring for the kids, etc. like it ain't nothin' but a thang! This surprises me more than you might imagine. Weight gain: I'm actually not shying away from this topic this time around. I think the fact that I had to completely overhaul my diet and cut back on calories in order to effectively manage my blood sugar has really helped in the weight control department. Looks like I've gained about 16 pounds since October 2012. And I started tracking my weight daily back in January, and I'm astonished to admit I've only gained 2.5 pounds in the past 3 months!! I'm also excited I haven't seen any significant swelling this time around, either! Mood: SUPER EXCITED!!! I can't wait to meet him and hold him for the first time! His room is ready -- I just need to pack our bags and pick up a few remaining necessities from our registry. I can't wait!!! Size of baby: According to BabyCenter, this week he should weigh almost 6 pounds and be more than 18 1/2 inches long. Next appointment: I had an OB appointment this morning to do a growth ultrasound, see the doc and do my GBS test. I have another appointment on Friday for a Non-Stress Test (NST). Basically I've been going twice a week for an ultrasound and NST since 34 weeks, and will continue to do so through week 38. What I've been up to: I finally got the nursery put together and ready. Clothes are washed, most of the essentials are purchased, and the Pack n' Play is set up in our bedroom. I still need to pack both mine and the baby's hospital bags and sterilize the bottles, pacis, pump parts, etc. But overall we're in a GREAT PLACE with our preparations! And it's a good thing, too! Arrival plan: The game plan is to schedule an induction at 39 weeks, which is Tuesday, April 30th. With gestational diabetes, I was told there is a significant risk of the baby growing too big too fast, which is why they've had me managing my diet and blood sugars so closely. Apparently I've been doing a little too good at this. At today's ultrasound, the little guy was only measuring 5 lbs. 4 oz., which means he's gained less than a pound since his last growth ultrasound 3 weeks ago. This puts him around the 13th percentile for weight at 36 weeks (my OB said she wouldn't worry unless it was under 10%, but we're only talking 3 points so now I'm a nervous mama!). The doctors will repeat another growth ultrasound in 2 weeks to see if he's gained adequately (at approximately 1/2 pound per week, he should be at least 6 lbs. 4 oz.). If he's not gaining appropriately, they will most likely have me deliver sooner, at 38 weeks. Apparently if the baby isn't gaining weight the way they want him to, it typically means he's not getting adequate nutrition from the placenta and they will want to deliver him sooner so he's no longer dependent on the placenta and can get his nutrition from breast milk instead. So the big plan for me is to desperately try to keep my blood sugar as level as possible (I've had lots of crazy highs and a few super lows) as the spikes in blood sugar are not good for him. I've gotta be sure to keep up the protein and limit the carbs & sugars, and just hope and pray that this little boy gains the appropriate amount of weight over the next 2 weeks. For documentation purposes (and a legitimate reason for me to throw up in my mouth), here's my 36 week picture. My compliments to my 3 1/2-year-old son for his crazy-mad photography skills. Boy knows his way around an iPhone! And my apologies for my horrible posture! Ugh.